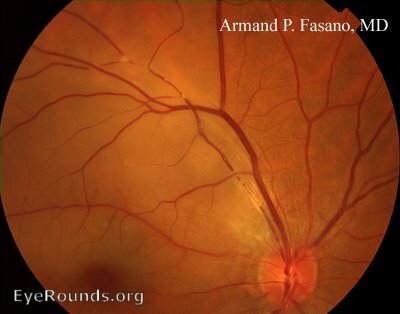 31-year-old female presented with an acute onset inferonasal visual field defect in the right eye and found to have a superior branch retinal artery occlusion (Figure 1). No emboli or Hollenhorst plaques were seen in either eye. Workup included an EKG, carotid doppler, cardiac echo, ANA, ACE, RF, CBC, PT/PTT, anticardiolipin ab, RPR, ANCA, ESR/CRP, which were all negative. 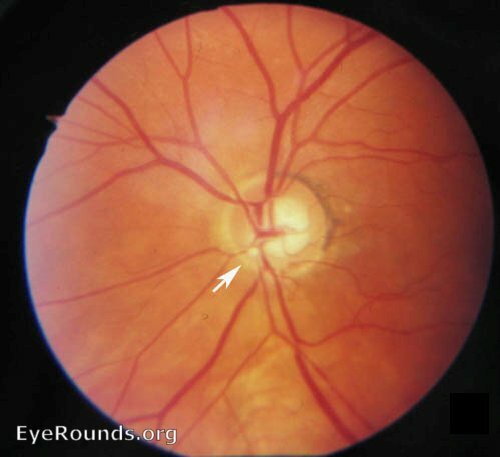 1 month later, the retinal whitening and edema resolved (Figure 2), but she still had a residual inferonasal visual field defect of the right eye (Figure 3, Goldmann Visual Field). Arrow denotes emboli in inferior arteriole. Here, multiple yellowish refractile bodies can be seen scattered throughout the arteriols in the superior arcuate region. No one may use these photographs for financial gain without written authorization from the contributor.